Following my interview with Dr Gill Braulik of the Wildlife Conservation Society Tanzania Programme, I set out to find out what happens in Kenya as far as scientific monitoring of the migrating whales and dolphins in Kenyan waters is concerned. Dr Braulik with her team of Tanzanian researchers had taken me along on the first ever survey of the cetaceans along Tanzania’s coast line. On the Kenyan side, since 2006 Global Vision International (GVI) has been running a whale and dolphin research programme from its base in the little-known village of Mkwiro on Wasini Island across mainland Shimoni on the South Coast. “GVI had been surveying whales and dolphins but there were no surveys along the North Coast (of Kenya). We realised that there was a gap in research and applied for funding,” said Jane Spilsbury of Watamu Marine Association (WMA), who is co-ordinating the current whale and dolphin survey in Kenya. I had joined her for a morning survey off Watamu’s coastline — 200 kilometres north of Wasini Island — when she shouted “dolphin!” By the time we turned to look, the dolphins had disappeared back into the depths of the ocean. Dolphins are flagship species. An ocean with a healthy population of dolphins is an indication of a healthy environment for other marine life. “As top predators, dolphins survive on what’s in the ocean, and if there’s enough to prey on, it shows a healthy ecosystem,” said Spilsbury. Whales and dolphins are closely related and scientists believe they were once land creatures who took to the oceans between 55 million and 50 million years ago. Several civilizations revere these sea wanderers. In Hindu mythology, the Ganges River dolphin is associated with Ganga, the goddess of the Ganges River. Ancient Greeks had images of dolphins on their coins and in later art, Cupid the god of love is shown riding on the back of a dolphin. Modern folklore abounds with tales of dolphins leading ships out of troubled waters and fighting off sharks attacking humans in water. Yet, despite all this, dolphins and whales today are in decline and their worst enemies are humans. Hunting, pollution, plastic garbage, over fishing, accidental strikes by vessels and drowning in fishing nets is taking a toll of their population. Since 1986, when a ban on commercial whale hunting was placed by the International Whaling Commission, over 30,000 whales have been killed. Japan, Norway and Iceland still kill 2,000 whales between them each year and continue trading in whale products. Dolphin tours worldwide are popular, with an increasing number of boats with holiday makers scanning the waters for the elegant sea creatures. Unfortunately, many dolphin boat-operators are untrained and chase after the dolphins, which is stressful for the animals. Highly intelligent and living in social pods, mothers care for their young just as human mothers do. “Quite often, the young will be flanked by adults for protection, or by the mother and a ‘nurse’,” said Spilsbury, who after so many years of watching dolphins has an intimate grasp of their social behavior. One way of involving local boat operators is by hiring their boats for the survey, which has helped us to develop good practice guidelines for dolphin and whale watching,” she said. Riding on the back of WMA research, Hemingways Watamu, the luxury resort, started the first whale watching excursions in 2012. 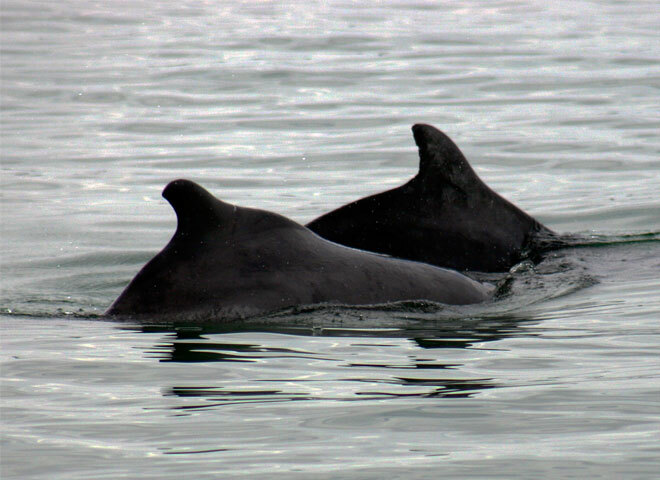 WMA now offers its professional guide services for boats doing dolphin watching. It’s a win-win situation as it helps WMA with data collection and photo identification while promoting Watamu’s tourism industry — including a promotion on the Twin Migration — of the wildebeest in the world-famous Maasai Mara and humpback whales in Watamu as the timing is the same — both migrations begin in July. Humpback whales migrate from Antartica where they feed on krill, all the way to the eastern shores of the African continent, using the land as a guide to the safe warm waters off Tanzania, Kenya, Mozambique and Somalia, where they give birth. They are also a priority species for the WCS. “Watching humpback whales is amazing,” said Spilsbury. “They are 40 tonne-creatures but with elegant moves. Sometimes they leap out of the water, or do a full body leap, showing off their long pectoral fins. But there is a big knowledge gap in what we don’t know about whales and dolphins. Since GVI stopped work at the South Coast last year, WMA is the only organisation surveying whales and dolphins along Kenya’s Coast, working closely with the Kenya Wildlife Service, Kenya Marine and Fisheries Research Institute, GVI, World Wide Fund for Nature (WWF) in Kiunga close to the Somali border and local communities. This collaboration has resulted in the Kenya Marine Mammal Network. Its aim is to provide consistent data on marine mammals along the Kenyan coast, define their crucial habitats and improve local understanding of these species. The data is important for marine mammal conservation and management strategies in Kenya.